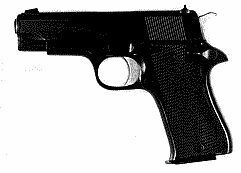 These are slightly shortened versions of the Model B pistol, available in 9 mm Parabellum only. The BM is steel and the BKM is alloy framed. It also is designed for security and other work where a full-sized pistol would not be advantageous, but there is a requirement for a full-sized caliber.